Manchester Airport, an international airport in the village of Ringway, is yet another one of the gateways to the United Kingdom. Officially opened in 1938 as Ringway Airport (after the village) in 1975, its name was changed to Manchester International Airport until 1986, when it became Manchester Airport. Today, this airport offers flights to 199 destinations. Manchester Airport (IATA code: MAN) is the third busiest airport in the United Kingdom and the hub for Flybe. 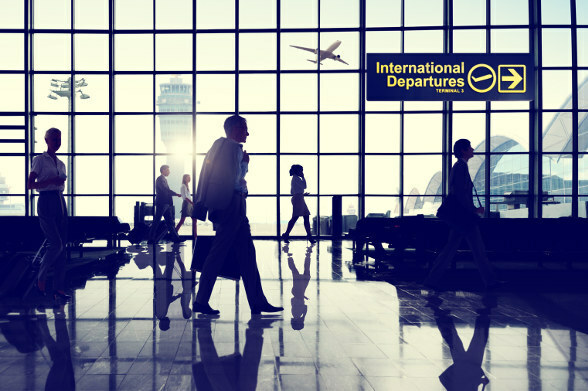 Flights to Manchester Airport are available from international airlines such as Emirates, British Airways and Air France. MAN is a 25-minute drive or a 20-minute train ride from the city centre of Manchester. Book your cheap flights to and from Manchester Airport online! Manchester is one of the most active airports in the United Kingdom and boasting plenty of history. It dates back to 1938, before the Second World War, when it served as the base for the Royal Air Force. With its three terminals, it became the third busiest airport in the UK in 2016, welcoming more than 25.6 million passengers through its doors. This should come as no surprise to you thanks to the wide selection of facilities, eateries, shops and entertainment available for you to enjoy. Book a flight to Manchester Airport with cheap flights from Lagos to Manchester. Treat yourself to a shopping adventure at the numerous retail outlets at Manchester Airport. Even duty-free shops are available amongst these many stores. You can shop for anything, be it electronics, accessories, beauty products, groceries, stationery, fashion and health products. Take note to keep the baggage restrictions in mind when you’re at Manchester Airport. For any medication and minor health concerns, a number of pharmacies are available in all of the terminals. When you’re done with all your shopping, head over to the wide selection of commercial restaurants, unique eateries, fast food outlets, bars and cafés. Relax at one of these numerous establishments and enjoy the variety of delicious meal options. Manchester Airport includes Escape Lounges in all the terminals, which include features such as complimentary buffet food, unlimited complimentary Wi-Fi, flight information screens as well as device charging points. For travellers seeking more luxury, more privacy and a more intimate setting, check out Manchester Airport’s beautiful 1903 lounge, which caters to adults only. Available in Terminal 3, this lounge is designed solely for solo travellers and couples. Other facilities at the airport include Wi-Fi (free for 60 minutes, or alternatively £ 5.00 per hour, £ 10.00 per day and £ 30.00 per month), a chapel in terminal 1, prayer rooms in all the terminals, tours, conference facilities, currency exchange as well as shower facilities. Etrop Grange This 3-star Victorian hotel is within walking distance of Terminal 2 of Manchester Airport. It includes amenities such as breakfast, 9 meeting rooms, daily housekeeping, a garden, car rentals on site, a 24-hour front desk, a restaurant and a bar/lounge. Additionally, you can make use of free Wi-Fi and a free airport shuttle. Clayton Hotel This contemporary 4-star hotel is situated on Outwood Lane of Manchester Airport. Amenities included comprise of a fitness centre, a conference centre, an arcade/game room, a computer station, a train drop-off service, a restaurant as well as a bar/lounge. Additionally, free Wi-Fi and a free airport shuttle are available. Radisson Blu Edwardian Manchester Hotel This 5-star luxury hotel is a 20-minute drive or a 35-minute train ride from Manchester Airport. It includes a full-service spa, breakfast, a 24-hour fitness centre, a 24-hour business centre, a limo/town car service, air conditioning, an indoor pool and restaurants. Additionally, free Wi-Fi is available. You will need to order foreign exchange 60 days in advance of the collection date. This order can only be collected in person. You will need the following documents to order foreign exchange. Travelex outlets and ATMs are situated in all three of Manchester Airport’s terminals. Manchester Airport features a multi-storey parking area available for short and long stays. JetParks is a cheaper parking option that is ideal for 1 to 2-week stays and suitable for all the terminals. You can pre-book your parking spot on the airport’s website. Manchester Airport is 13 km south of Manchester’s city centre. Coaches, trains, taxis, buses, chauffeur services, Uber and car rental options are available to get you from the airport to your destination.